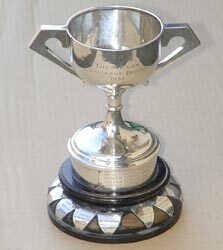 The full name of this magnificent trophy is the 'Seagrave Memorial Challenge Trophy for Model Speedboat Racing'. It was donated anonymously to the MPBA in 1930 following the death of Sir Henry Seagrave at Lake Windermere. In 1936 the Innocent Brothers won it for the third time and as was the custom at the time, it became theirs to keep. 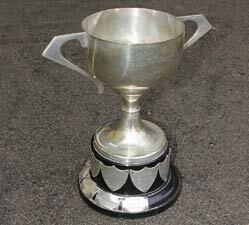 The brothers donated it back to the MPBA in 1977 for annual competition to be awarded to the person breaking any waterscrew record by the largest margin. The first winner was G C Harris at 26mph and the most recent Norman Lara at 141mph, exactly 100mph faster than the Innocents in 1935. These B1 airscrew boats both appeared on eBay in October yet no one could pin them down until the vendor informed us that the one on the left was built around 1999 and originally had a Cyclon motor and the white boat built a couple of years later a Profi, both top end engines in this class. The owner finally got the blue boat running successfully at Kingsbury in 2001 and the lessons learnt applied to the later boat. Trawling through Model Boats for the period mentioned unearthed a photo of Jonathan Drinkwater with the blue boat at the international meeting in July 2000 at Payre, France where he finished 4th. Jonathan's father Mike was almost entirely responsible for the growth and success of airscrew boats in this country and Jonathan continued to develop the concept with the boats seen above and an even more radical design he took to Kingsbury recently. 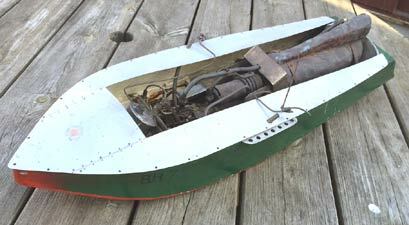 This boat appeared at Victoria around 1939, although it had been built by Fred Lowne of the Blackheath Club. 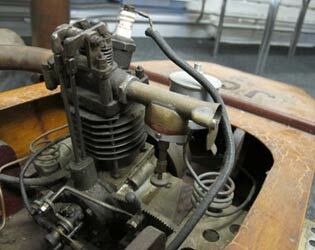 The motor was some 10 years older and its very complex valve gear featured in 'Experimental Flash Steam'. 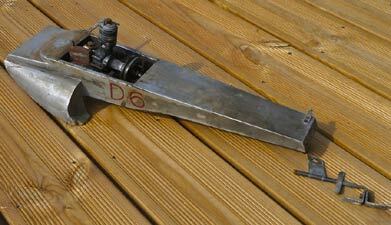 The last known sighting of this boat was in 1945 at the Kent Model Engineering Exhibition. For a fuller description of this boat and motor Fred Lowne was the first of our Flash Steam Gallery subjects. Following the second war there was a move to what was called the 'Austerity Class' utilising engines much smaller than the 15cc and 30cc motors that were the norm. 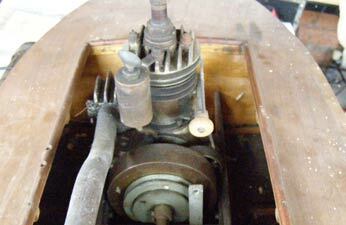 Members of the Derby Club seemed to specialize in these smaller boat with several 10cc models as well as 5cc and this example with a 2.4cc Mills engine. These capacities were to become the C, D, and E classes. 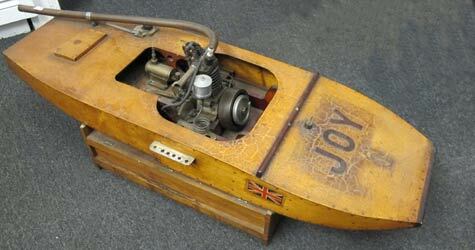 This model was built by Mr Jackson of the Derby Club and was a scaled down version of his 10cc White Ensign with its Westbury 'Ensign' motor. 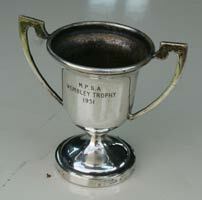 Presented to the MPBA in 1934 and first raced for in 1935. 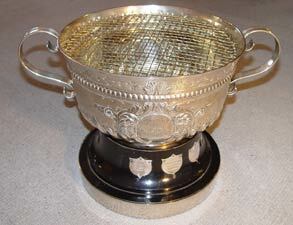 A Grand Regatta trophy open to all boats, steam and IC as long as the hull, engine or both were built by the competitor. 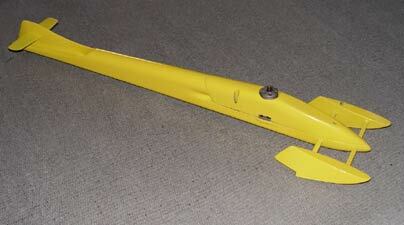 The second of the MPBA trophies run over 1000yds, one run only but two starts allowed. Run in conjunction were the Wembley and over the first 500 yards the Crebbin for steam boats. The first winner of the Mears was engine designer F. N. Sharp from the South London Club, and the last name on the trophy Jimmie Jones from Birkenhead in 1979/80. The Grand is now a shadow of its former self with no hydroplane involvement and the Mears a footnote in history but with a host of famous names engraved around its base. 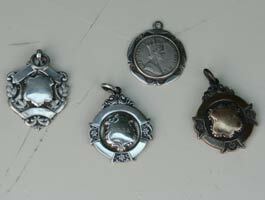 At one stage, every regatta and competition would award miniature trophies, medals and spoons and luckily these ones have been engraved so we know which event they were for. From the left we have the Wembley Trophy 1951. 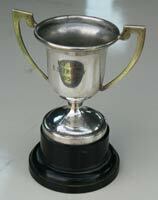 The ED Trophy 1950. The Hispano Suiza 1952, the most prestigious event of the year, sadly defunct. Medals for Wembley Trial 1951? Miniature Speed Trophy 1953 and the Wembley again for 1954. This was just a small selection that Steve very kindly dug out for us and most competitors from that era and before would probably have dozens of similar items. 'C Class' weight limit. Rob Bamford's 'Fireworks' is the only one we know of currently, but we are not sure if the class still exists. The most obvious feature of this boat is the extra long Bamford/Jutton style flame tube on the steam generator and the very short casing. Sadly, this boat is a yet to be finished project, although there is little more than detailed plumbing to be completed. 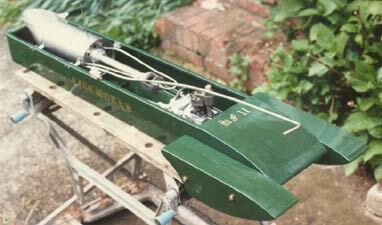 This A Class flash steam boat was the last built and run by the late Keith Norfor of the Victoria Club and last run in the 1990s. 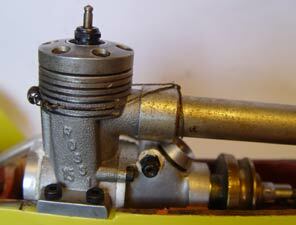 The power unit incorporated several elements of design from IC engines and also used some commercial components. The steam generator is more conventional with three venturi flame tubes. A longer article about Keith and his boats will appear in a future edition of 'Flash Steam gallery'.